The incredibly small bits of matter we call neutrinos may hold the secret to why antimatter is so rare, how mighty stars explode as supernovae, what the universe was like just seconds after the big bang, and even the inner workings of our own planet. For more than eighty years, adventurous minds from around the world have been chasing these ghostly particles, trillions of which pass through our bodies every second. Extremely elusive and difficult to pin down, neutrinos are not unlike the brilliant and eccentric scientists who doggedly pursue them. 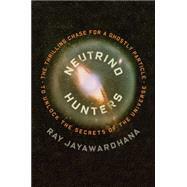 In Neutrino Hunters, the renowned astrophysicist and award-winning writer Ray Jayawardhana takes us on a thrilling journey into the shadowy world of neutrinos and the colorful lives of those who seek them. Demystifying particle science along the way, Jayawardhana tells a detective story with cosmic implications—interweaving tales of the sharp-witted theorist Wolfgang Pauli; the troubled genius Ettore Majorana; the harbinger of the atomic age Enrico Fermi; the notorious Cold War defector Bruno Pontecorvo; and the dynamic dream team of Marie and Pierre Curie. Then there are the scientists of today who have caught the neutrino bug, and whose experimental investigations stretch from a working nickel mine in Ontario to a long tunnel through a mountain in central Italy, from a nuclear waste site in New Mexico to a bay on the South China Sea, and from Olympic-size pools deep underground to a gigantic cube of Antarctic ice—called, naturally, IceCube. As Jayawardhana recounts a captivating saga of scientific discovery and celebrates a glorious human quest, he reveals why the next decade of neutrino hunting will redefine how we think about physics, cosmology, and our lives on Earth. Ray Jayawardhana is the dean of science and a professor of physics and astronomy at York University in Canada. His writing has appeared in The New York Times, The Economist, Scientific American, and elsewhere. A 2014 Guggenheim Fellow and the author of Strange New Worlds, he lives in Toronto.